What makes an ornithischian dinosaur? All terrestrial animals and even marine animals derived from terrestrial stocks have hip girdles, or pelvises, and all hip girdles are composed of three bones: the ilium, ischium, and pubis. All ornithischians are united by a pubis pointing backward, running parallel with the ischium. The name "Ornithischia" means "bird-hipped," and birds also have pelvises in which the pubis points backwards. However, birds are more closely related to the Saurischia, or "lizard-hipped" dinosaurs, than to the ornithischian dinosaurs featured on this page. 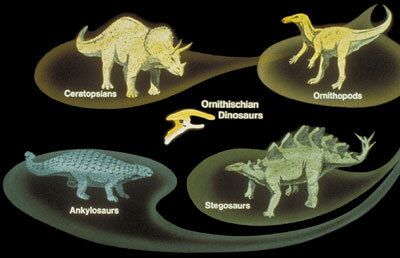 The hip girdle of a typical ornithischian dinosaur is enlarged in the second diagram at right. In the diagram, the pubis is pale orange, the ilium is red, and the ischium is brown. There were many kinds of ornithischian dinosaurs, dating back to the early Jurassic. The Ornithopoda included the hadrosaurs ("duck-billed dinosaurs"), the iguanodontids, the heterodontosaurs, the hypsilophodontids, and various other dinosaurs. The Ceratopsia included the horned dinosaurs, the Ankylosauria and Stegosauria (now usually grouped together in the Thyreophora) included various types of armored dinosaurs, and the Pachycephalosauria, the extremely thick-skulled pachycephalosaurs.